- Drop used insulin syringes and lancets needle-first into opening closest to edge. - Do not reshield the needle. - Carefully insert pen tip into center opening at a 45-degree angle and push firmly until pen stops. - Rotate pen to the left several times while applying continuous forward pressure to loosen pen needle. - Needle will fall into container after pen is removed. - If pen needle gets caught in opening, use pen to push it into the container. Do not use your fingers or hands. - DO NOT OVERFILL. SEAL CONTAINER WITH PERMANENT LOCKING LID WHEN FULL. - Discard properly. Follow local trash ordinances where applicable. - Keep container out of reach of children. If disposing of pen needles for someone else, please use a mounting bracket. 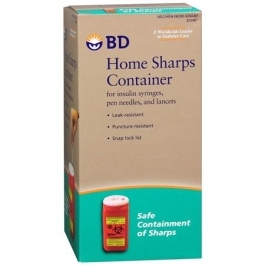 You can recieve this free of charge, by calling BD at 1.888.BDCARES (1.888.232.2797). If mounting bracket to a wall make sure instruction label can be seen. For help with your product, please call the BD Customer Service Help Line at 1.888.BDCARES (1.888.232.2737), Monday - Friday, 8:00 am - 8:00 pm, Eastern Time. You can also reach BD Customer Service with customer feedback at https://forms.bd.com/diabetes/pc209/index.sp.